We clown to free the "inner kid" in children and adults alike. As humanitarians, we fund life changing improvements for children in need. 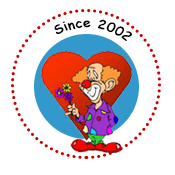 We are a passionately committed all-volunteer nonprofit, clowning globally to heal and expand the human spirit. We connect with people, uplifting spirits, beyond language and cultures, and we fund projects to help children. Help us to help kids, join-us, donate or hire us.